I've made a Neon Genesis Evangelion character selector test! It tells you who resembles you the most! Please spend some time to take my test,then share your results by posting your image over here. Did you program this thing right? Kensuke here too. These nasty ad pop-ups just reminded me how short-tempered I am, hehe. Interesting. 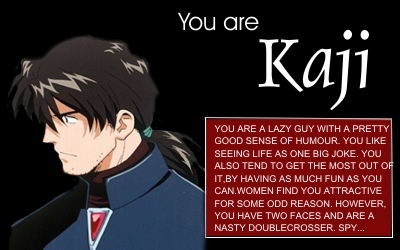 I am Misato's man. Anyway,let's see some more people's results! Oro? What's with the flags under our posts? 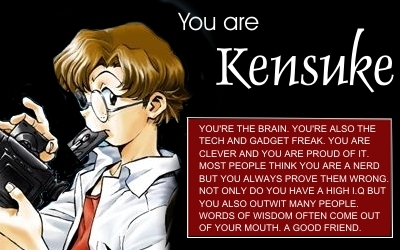 I turned up Kensuke as well... but since there's a ranking of the characters, perhaps a reporting of one's top three would give a more personal picture. 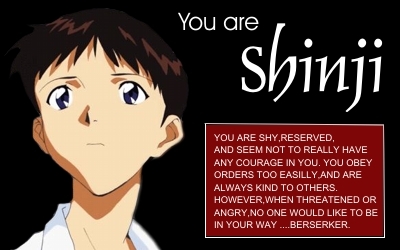 That being said, I'm a Kensuke/Shinji/Rei (Ritsuko in 4th). Woah, I am still the only 'non-Kensuke' in this thread. hmmm, that page shows a banner like picture which is really easy to miss. I'm GENDOU! But I'm not bossy...Why? Hehe... Iﾂｴm Asuka :smug: ... wait a minute..I am what! !